The Cuisinart C55-12PR1 is a pack of professional-quality stainless steel knives. The knives have a a cutting-edge, nonstick coating that makes slicing easier and allows coding during food prep to avoid cross-contamination. The knives come with matching blade guards and ergonomic handles. 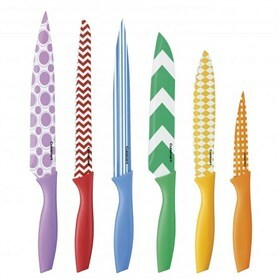 The Cuisinart Printed Color Knife Set - 12 Pcs has many exciting features for users of all types. You can extend the lifetime of your Cuisinart Printed Color Knife Set - 12 Pcs with the purchase of a FactoryOutletStore Factory Protection Plan. 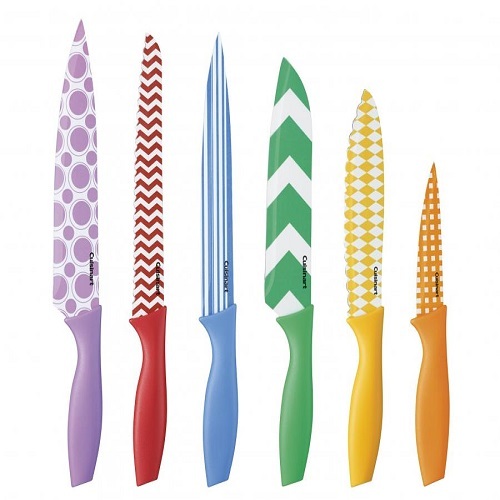 The Cuisinart Printed Color Knife Set - 12 Pcs is sold as a Brand New Unopened Item.